Almost as soon as August turned into September, the cool air seemed to have mostly replaced the intense heat up here in the mountains. We had a few cold rains, and the days are getting shorter by day. Suddenly hot tea and soups are gaining their appeal back. 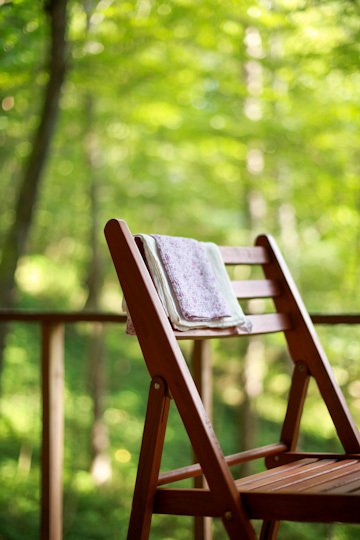 Although it can still be hot in the sun and cicadas are doing their best to make some noise, overall, we can tell the summer has come to its end. So it feels a little out of place - or frankly, foolish - to talk about summer foods now, but that's exactly what I'm doing. Because I had so many of them, and most of them so good it'd be a shame if I leave them undocumented (which has happened alarmingly often around here). 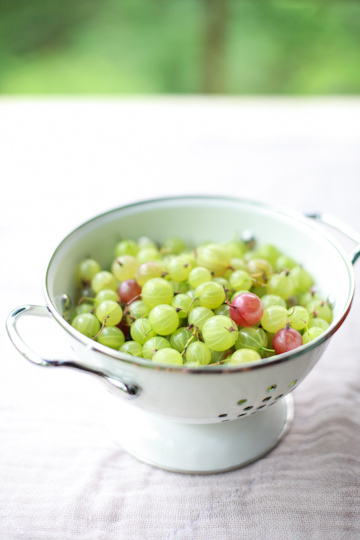 ... when local summer fruits began appearing, starting with young green gooseberries (and odd purple ones). A lot of them went straight to the freezer where they keep pretty well. And some of them were cooked up and whipped into a cool dessert. 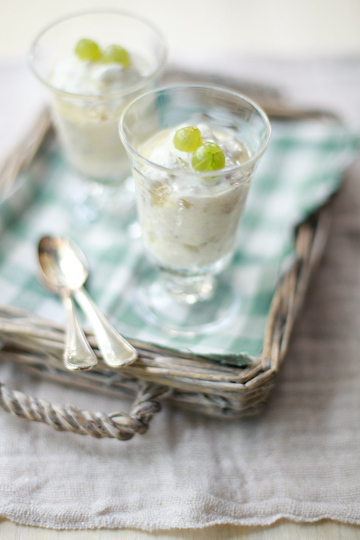 This is gooseberry and elderflower fool, an adorable English "pudding" of mashed/pureed fruits and cream. This one is a recipe from Tender: Volume II, A cook's guide to the fruit garden by Nigel Slater (Fourth Estate, 2010), the second of a two-volume series of Mr. Slater's stories and recipes inspired by his vegetable and fruit garden. I got the books just before the summer, and this was one of the first recipes I tried from more than handfuls I'd bookmarked, many of which in this fruit volume, Tender II (known as Ripe in the US market). The words "Gooseberry", "elderflower", and "fool" are all something I associate strongly with English summer, and this one effectively awoke a hidden Anglophile in me, over 6,000 miles away. ...raspberries, specifically. 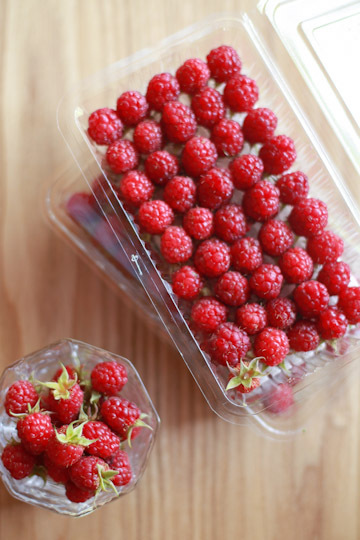 As I have grumbled before, raspberries sold in Japan are virtually all imported, and invariably expensive. 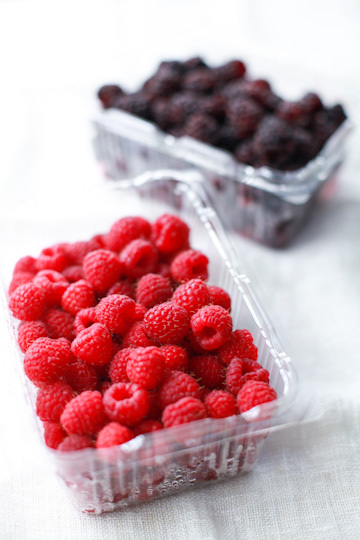 So it came as a surprise, or almost a shock, when I found punnets of locally-grown raspberries at a green market in my neighborhood. They were tiny, but fresher than any raspberry we'd buy imported, and tasted just as good, perhaps a touch more tart. I threw quite a few of them into my breakfast bowl of cereal, but even more found their way into desserts. 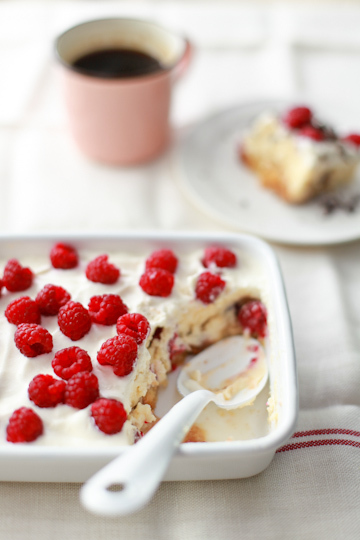 ...Such as this raspberry tiramisu, also from Tender II. 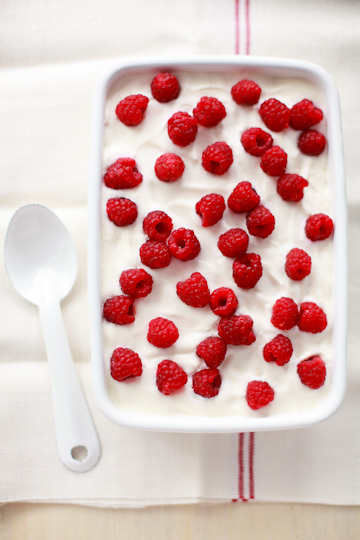 I was after recipes that use lots of fresh raspberries, with "lots" and "fresh" being the keywords here; frozen berries I can buy anytime (imported, mind you), and fresh ones (also imported) so painfully expensive I can only afford to buy barely enough for garnishing. So this was my chance to showcase the fresh berries, letting them shine in their own right. And this was one such recipe. I've tried and enjoyed a lot of fruit-based variations of tiramisu including those using strawberries and peaches, and they are all good, and this one didn't disappoint either. I liked the syrup made with white wine and creme de cassis, and my addition of shaved chocolate to garnish a scoop didn't hurt, I guess. ...among which one of the first was apricots. The fact that Nagano is the single biggest producer of apricot in Japan means that we can buy them pretty cheap at the store. But we were also lucky to be able to pick some really ripe ones off the tree in a family friend's backyard. 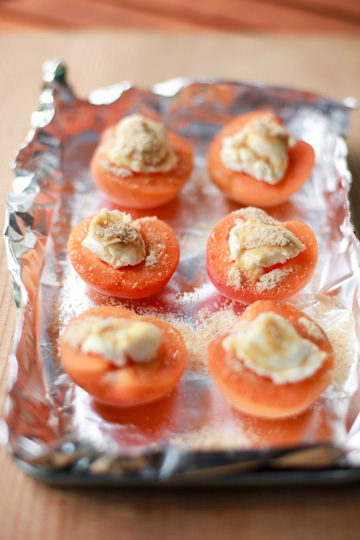 Broiling them, with a spoonful of mascarpone cheese and a bit of sugar, again from Tender II. The recipe (grilled apricots with mascarpone) calls for "seriously ripe apricots", and I think I did just that, by using the borderline overripe ones from my basket. 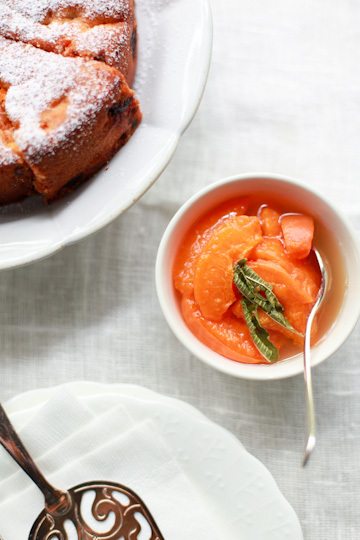 I loved how the warm and tart apricots were complemented by rich mascarpone. ...like, a LOT of them. 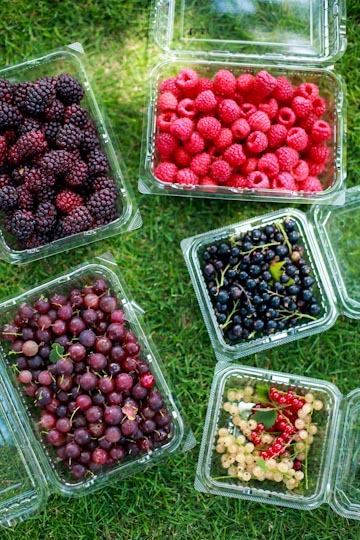 Large punnets of raspberries and boysenberries, a good amount of purple gooseberries, and a bit of currants - red, black, and white (!). So now we had seemingly a house full of fresh apricots and berries, most of which were on the perishable side. I couldn't be happier, but did have to come up with ways to use them up while they were still good. Much of the raspberries and boysenberries went down as is, or with my morning bowl of yogurt, like this one with homemade honeyed apricot sauce as I mentioned before. 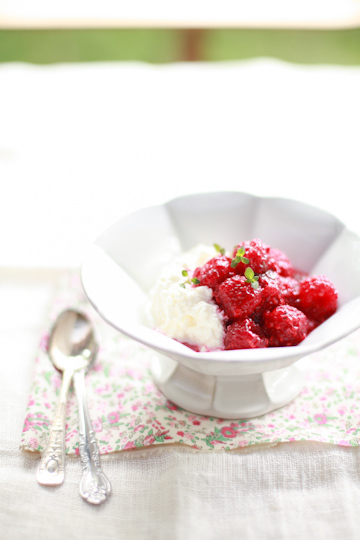 Even though I had more fresh raspberries (and boysenberries) than I'd ever had in my fridge, they were still precious and I was determined to use them fresh and whole as much as possible. So no baking, no stewing, no pureeing, no freezing. Anyhow, served with homemade 'ricotta', this made one simple but fine treat. The recipe, by the way, is from The Last Course: The Desserts of Gramercy Tavern by Claudia Fleming (Random House, 2001), one of my all-time go-to dessert books now unfortunately out of print. 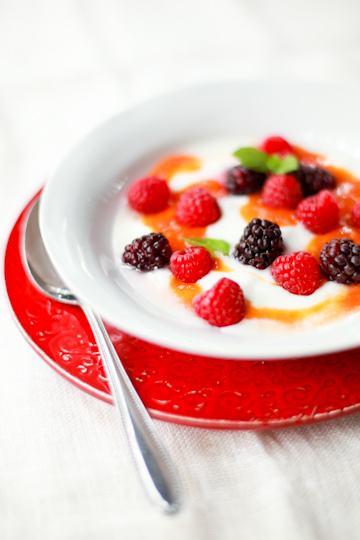 Her method of making fresh berry compote, in which you puree some of your fruits (sometimes cook them first) and toss the fresh ones in the puree, is my favorite way of serving fresh berries; the flavor of the berries are intensified while most of the berries remain fresh. 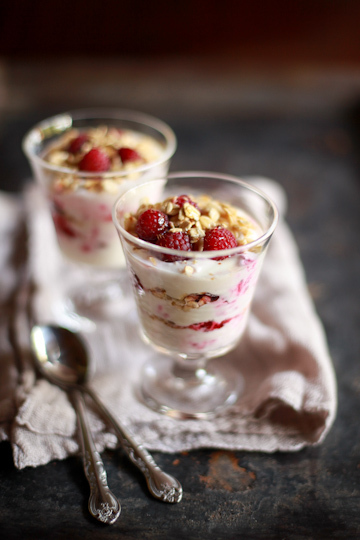 Raspberry parfait? Not exactly, but close. 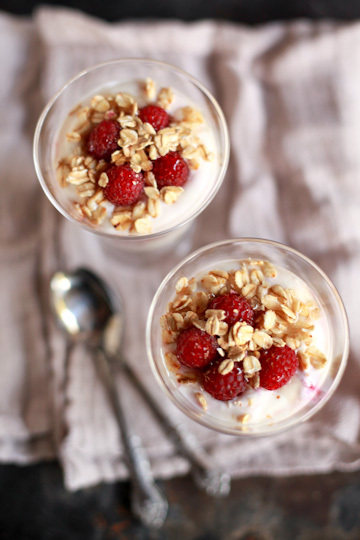 This is called cranachan, a traditional Scottish pudding that comprises of whipped cream, fresh raspberries, and toasted oats. I was introduced to this charming dessert by Nigel Slater in his book Tender II, but here I used another recipe - also his, but found elsewhere. I liked it better as it uses whiskey and honey in the cream, which seemed more traditional. That being said, I must confess that I used Japanese whiskey (not Scotch) and locally-produced multiflower honey (not heather), in addition to replacing half of the cream in the recipe with strained (thickened) whole-milk yogurt, which most likely isn't traditional, but not too uncommon apparently; I saw more than a few yogurt-based cranachan recipes on the Internet. At any rate, this was a really rich dessert, and really lovely. Crunchy toasted oats, very lightly sweetened, complemented fresh berries very well. 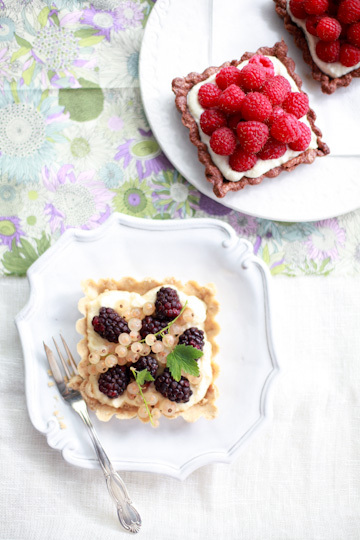 Atop buttery tart shells filled with cream were a pile of fresh berries, as in these raspberry chocolate tarts and boysenerry and white currant tarts (both from How to Be a Domestic Goddess: Baking and the Art of Comfort Cooking by Nigella Lawson [US Edition; Hyperion, 2001]). 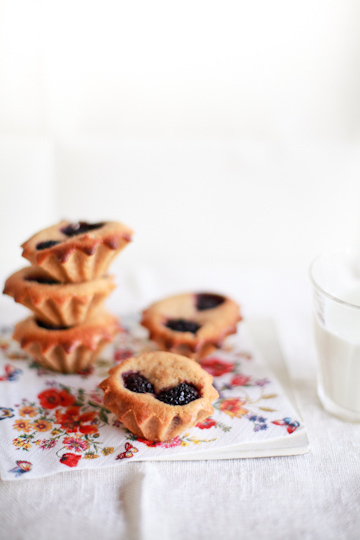 Tarts (and tartlets) must be one of the finest forms of serving fresh berries. 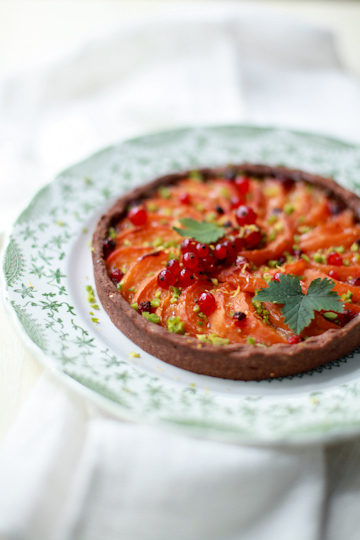 Like this apricot tart, the recipe of which is found in La Tartine Gourmande: Recipes for an Inspired Life, the stunning new book written and photographed by Bea, who is one of the most talented people I'm lucky to have come to know through blogging. In fact, I seemed to have been bitten by a tart-making bug this summer and made so many of them, I decided to do a separate post just for those fruit tarts; so here in this entry, I'll mostly feature non-tart sweets, which there are still many. And yes, remember I also had a lot of apricots? 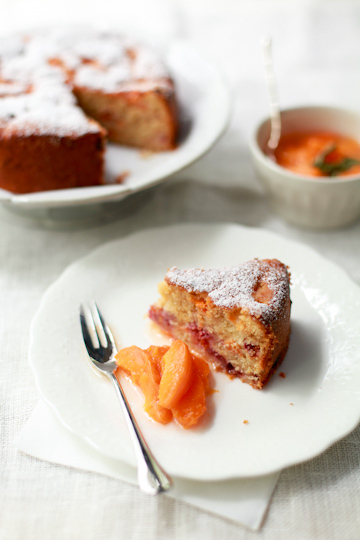 Unlike the berries, almost all of them were cooked in one way or another, like in this apricot and raspberry cake. This is another one of the recipes from Tender II (I did say I'd bookmarked a lot of recipes, right?) 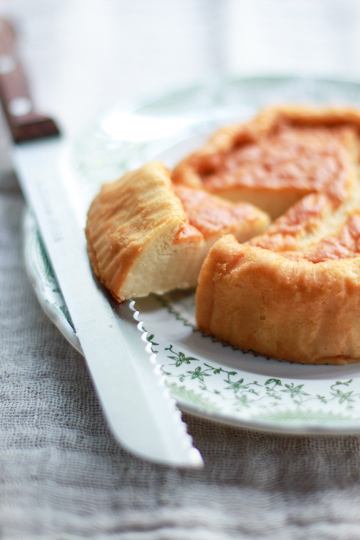 where it is given a beautiful name: "a cake for midsummer", and you can find it here. 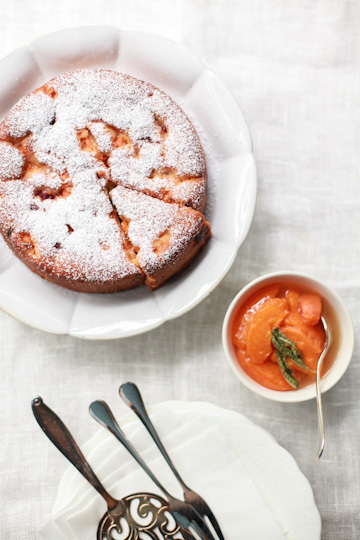 Alongside the cake was apricot compote - or lemon verbena-scented apricots, to be precise. Also from Tender II, this is originally "baked apricots with lemon tea", where the fruit is oven-baked in lemon verbena infusion. Since I couldn't find fresh lemon verbena, I had to use a dried kind and I did skip star anise (not my favorite). Then I sliced my fruit and stewed them on the stovetop rather than baking in the oven, just to cut the cooking time short. So on the whole, this was not really the same thing as what's in the book, but still lovely with a soothing flavor with a whiff of herby note. As for the cake, it is quite a rich-tasting cake with the use of ground almonds in the batter, but not heavy. And the apricots and raspberries added a pleasant tartness to it that we enjoyed hugely. 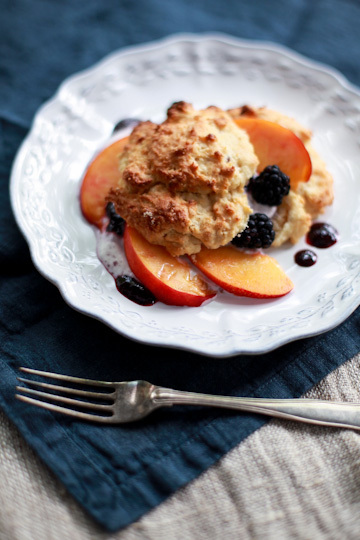 You can make it with peach and blueberries, which I'm sure will be just as nice. ...like apricot-boysenberry crisp? Crumbles, cobblers, and crisps are all right at my heart and I feel comfortable making them, especially after something elaborate challenging (for me) like tarts. This particular recipe - or, at least the crisp topping recipe, is from Ready for Dessert: My Best Recipes by one and only David Lebovitz (Ten Speed Press, 2010), which also has many wonderful fruit- and non-fruit-based recipes. What I found interesting about this recipe is that it uses cornmeal in the topping (thus called "polenta topping"), and it worked really well with the juicy fruits (which in the original recipe are apples, pears, and grappa-soaked raisins). You can find a very similar version of his polenta topping recipe here. I think this was the last thing I made with my boysenberries; they were on the verge of spoiling, and I had to used them up quick. It was sad to see my berries disappear, but was glad to have put them to a good use! And where did the last of the fresh raspberries go? why, into a flute glass, of course. 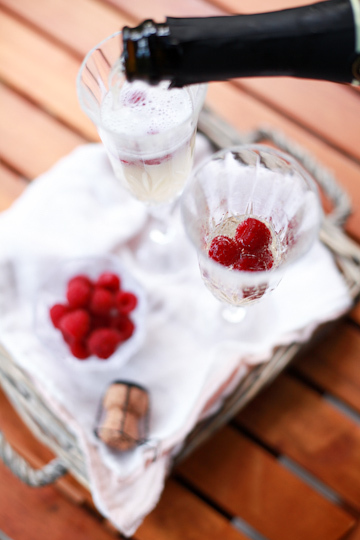 I'm known to throw just about any fresh berry (or other fruit) into my glass of sparkling wine, you see. I've also made a small jar of vodka-soaked raspberries, which I'm planning to enjoy topped with some bubbly later in the year. But for now, fresh and naked berries were just what I needed. 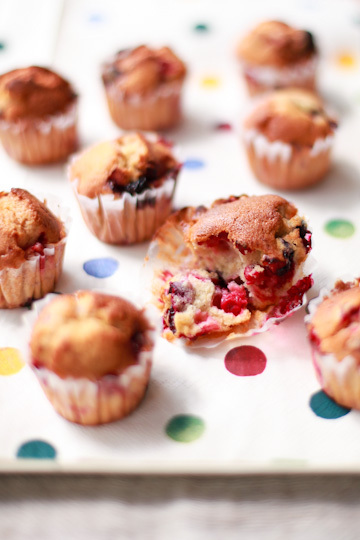 ...And then, what happened to other berries and currants that we picked? 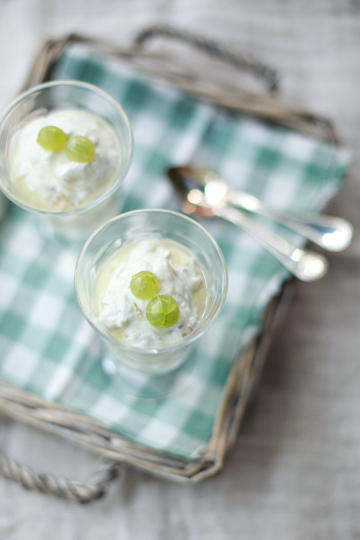 Other than tarts, much of them took a cold dessert route, like this gooseberry and elderflower sorbet. The original recipe has a lot of vodka in it, making it a bit slushy. But here I replaced much of the spirit with water and made it as a regular sorbet. I think this is meant to be made with sour green gooseberries, but the sweeter purple kind still made a mouth-puckeringly tart sorbet. Talk about refreshing. 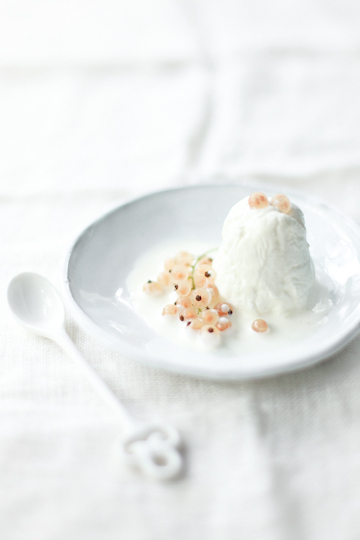 And this simple and clean dish was white currants and fresh cheese, called "a midsummer dessert of quiet perfection in Tender II, which I think says what it is so well. It is basically just fresh cheese (Petit Suisse cheese or fomage frais), a bit of cream and white currants; no sweetener involved, but you can taste the natural sweetness of the cream and cheese - in my case strained yogurt I substituted for the cheese. This probably wasn't quite what Mr. Slater would describe as a dessert of perfection, but still had a quiet charm and subtle elegance, owing also to the demurely beautiful white currants. Now these guys need to be cooked for us to enjoy them, and my entire small bowlful was a saucepan-bound. ...Then in a small jar. 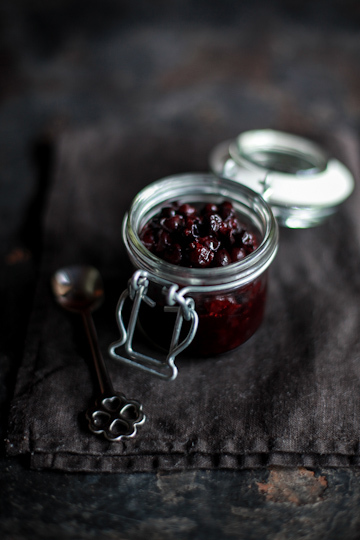 I made blackcurrant compote (not jam) by cooking them with a bit of water and sugar. 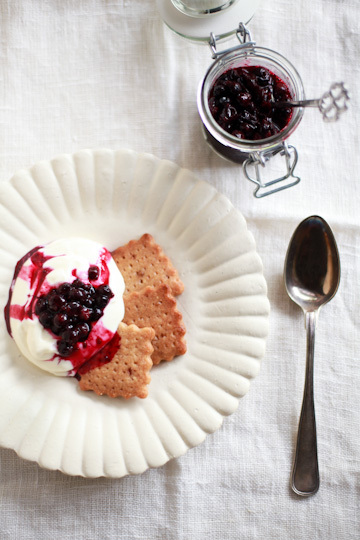 A dish of homemade graham crackers, fresh cheese cream, and blackcurrant compote. I had some of a homemade graham cracker dough lying around in the freezer (prepared based on the recipe in Claudia Fleming's The Last Course), and whipped up the cream by combining mascarpone cheese, strained yogurt, and melted white chocolate. I think I could argue this was a sort of cheesecake, except it didn't take a form of 'cake'. 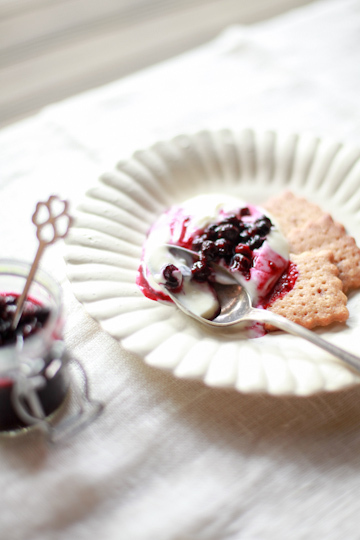 Perhaps you could call this deconstructed blackcurrant cheesecake, much like the blueberry version I did last summer. Whatever you call it, it was delicious. The compote also made a nice accompaniment to yogurt, and ice cream too - here, peppermint ice cream from Haagen-Dazs. This limited-edition flavor ice cream was fine but personally I prefer the supper minty, electric green homemade mint ice cream I made some years ago... gosh, I should be making it again! Speaking of ice cream, I did make a rather interesting one. Any idea what the flavor is in this one? Apricot? Well, yes and no - it was flavored with not apricot flesh but the kernels. When I made blanc manger (and then ice cream) with loquat kernels, I was already thinking about trying the same with apricot kernels. It took me a while before I actually got around doing it, but I saved apricot pits after using the flesh in other things, and cracked them up to collect the kernels. And let me tell you... you really do need a lot of apricot pits to get enough kernels to flavor a small amount of ice cream base. I think I used about fifteen pits for about a cup of cream. Still, the amaretto flavor was pleasant and we enjoyed the ice cream. 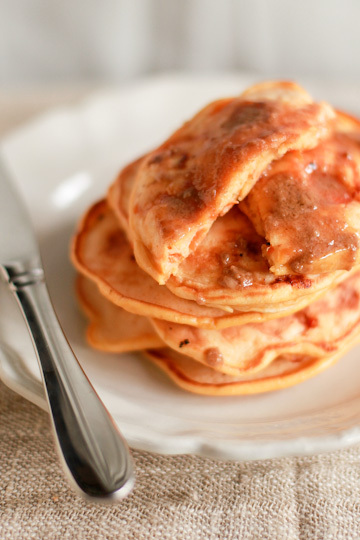 Pancakes for sunday brunch. 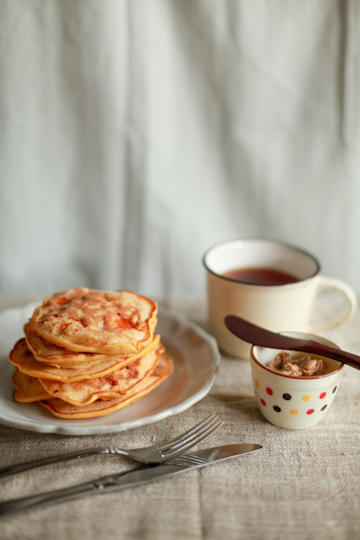 Based on this recipe, these apricot pancakes with maple butter were great; the apricot chunks in the batter got soft as they cooked, acting as a sauce in the fluffy pancakes. My maple butter wasn't exactly the most photogenic thing, thanks perhaps to the fact that I made it with maple sugar rather than maple syrup, but it still provided just the right warmth and sweetness to the nicely tangy pancakes. 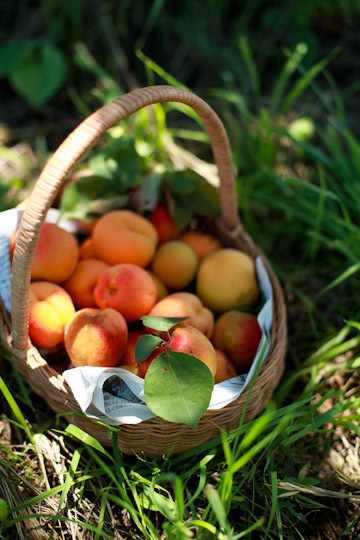 And as the brief apricot season passed by, other stone fruits started filling up the fruit isle of the grocery stores and green markets in late July and early August. Nectarines are another specialty in Nagano, and we are lucky to be able to buy them cheap. My favorite of all stone fruits, or possibly all fruits, has always been the white peach (Japanese, please) but in recent years the white nectarine has shot up on the list. I enjoy yellow ones, too, but the lusciously sweet white nectarines are irresistible. So much so, in fact, I couldn't help but pick up a bag every time I saw them at the store or the market, thinking "this could be the last one I see this summer". Fortunately, they were around for weeks, so my breakfasts were heavy on nectarines for nearly a month. 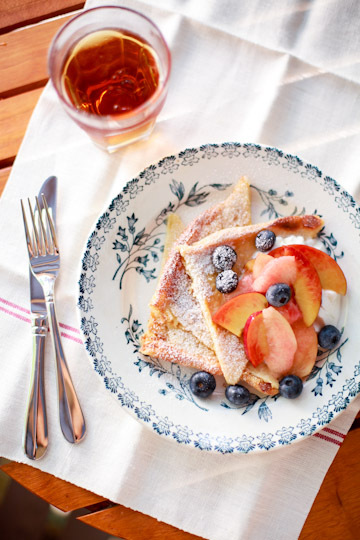 This was one such breakfast, where I had white and yellow nectarines, white peaches as well as blueberries alongside a few triangles of oven-baked pancakes. Not exactly same as the more common, pan-fried kind, oven-baked pancakes are nonetheless tasty, flipping-free option for breakfast, and go really well with fresh fruits and/or cream (here I had yogurt). The pancake recipe I used can be found here. 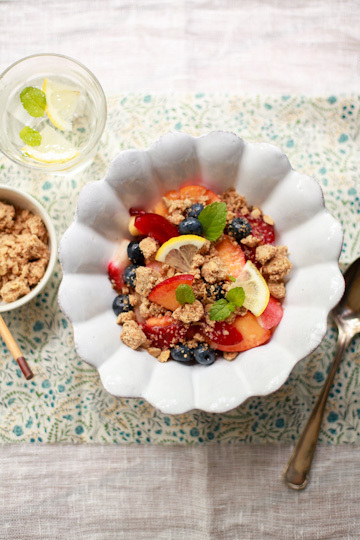 Another fuss-free breakfast menu that is my favorite is fruit crumbles. 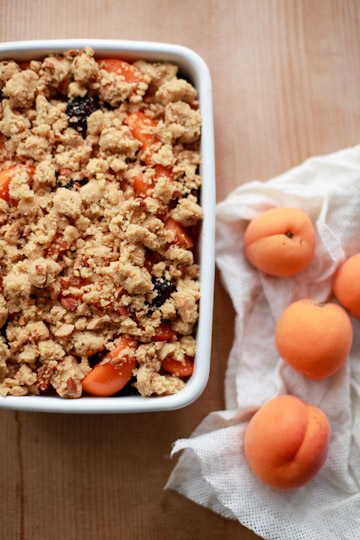 I love all sort of fruit crumbles all year around, but in the warm months when I like to have fresh fruits fresh, I bake a crumble topping and sprinkle some over an assortment of fresh fruits, tossed in a bit of honey and lemon juice. Here I had the white and yellow nectarine, white peach, blood-red plum, and blueberry, but just about any fresh fruits that are in season will do. You can use any crumble topping recipe you like, but for fresh fruits I like a buckwheat and olive oil mixture, with a very little to no sugar added, flecked with finely chopped fresh mint leaves. Here I threw in a handful of rolled oats and that it was great too. Remember to serve it with extra topping - you'll need it! 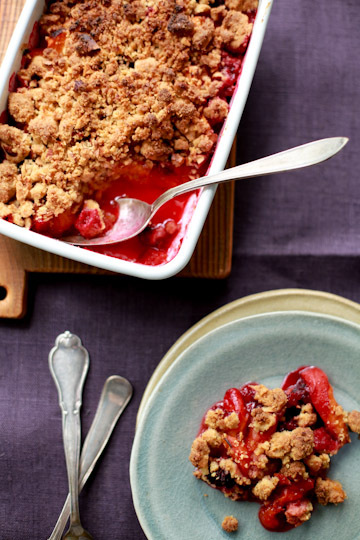 This fruit salad crumble was a huge hit last summer, and proved just as winning this summer. While I prefer white nectarines (and peaches) uncooked, I think yellow nectarines are more enjoyable cooked. That said, they can be really pleasant served fresh, especially together with other fruits that are really sweet, or some cream. And this nectarine and blackberry shortcakes with blackberry cream played out beautifully; tart yellow nectarines, buttery shortcakes, rich cream, and deeply flavorful blackberries. The original recipe uses peaches, which evidently are meant to be yellow peaches. Now fresh yellow peaches, especially the red-skinned, firm kind you see in the US, are not at all common in Japan, and I find the yellow nectarine to be the closest thing you could get. And it worked perfectly fine here. They are not common, either, even here in Nagano that produces a larger variety of fruits than most other areas in the Japan. 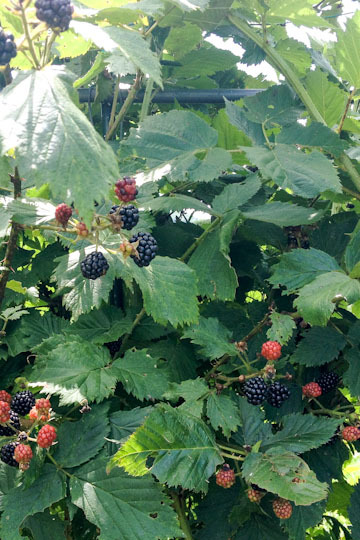 In July I traveled over an hour to pick raspberries and other not-so-common-in-Japan berries and currants, but then found a small farm that has blackberries (not raspberries) in an area a lot closer to where I'm at. Hooray! They are one of the many blueberry farms that are open to the public in this area, but must be the only one that has blackberries. The first thing I made with the just-picked blackberries were some tarts, and then this. Just tossed in vanilla sugar along with plums, these vanilla-scented plums and blackberries are hardly something you can say you 'made', but there you go. The recipe is here. And I did eat a fair share of these blackberries as is, then eventually reached a conclusion that, unlike many other berries, I like blackberries better cooked. In one way or another. 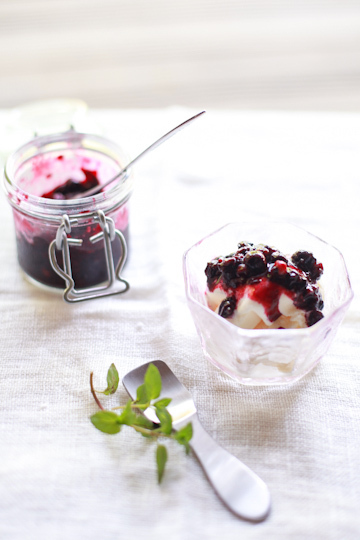 This ice cream, for instance, makes use of cooked blackberries, pureed and then swirled into sweet and creamy sweet corn ice cream. 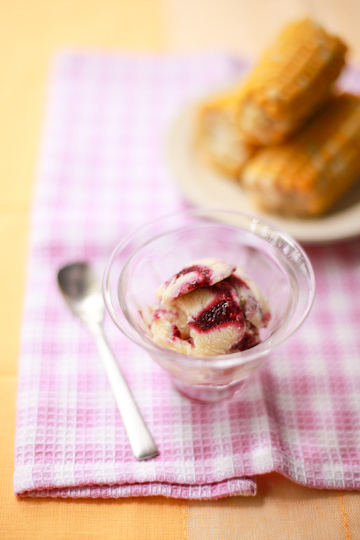 Yes, this sweet corn blackberry swirl ice cream was quite a stunner. If you think sweet corn ice cream sounds weird or just plain wrong, think again; it's delightful. I made sweet corn ice cream before and we all loved it - it went really well with blueberries, and I was sure blackberries would be great too when I came across the recipe from this book. Here I used this recipe for the sweet corn ice cream base, using honey as the sweetener. Worked great. The ice-cream is tasty as is, but that much I had already expected. What exceeded my expectation was something that I had using it. 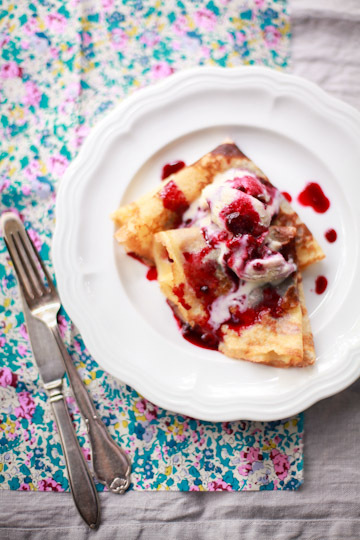 That something else is cornmeal crepes and blackberry compote, whose recipe is by Claudia Fleming (the author of The Last Course) that I found in The New York Times Dessert Cookbook (Florence Fabricant Ed., St. Martin's Press, 2006). Actually, I just tried the recipe without thinking much, then noticed that the recipe suggested that the crepes can be served with sweet corn ice cream - which, conveniently, I had in my freezer. So I tried it, and loved it - we all did. The crepes were nice, the blackberry compote in them were fine, and the ice cream was good. But together, they made an excellent dish. 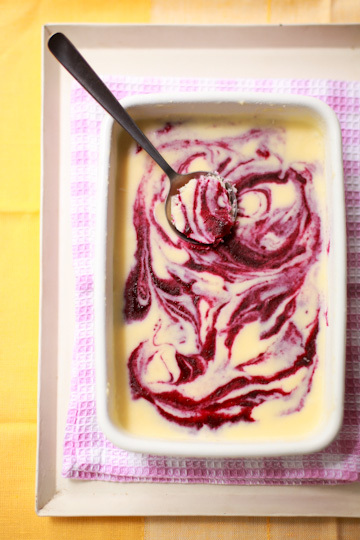 Layers of sweet corn and blackberry, all in different textures and temperatures. You can see the ice cream is melting quick (it was hot here!) so we had to wolf it all down quick, but I wish I could have taken my time, savoring every bite. So good! An ice-cold, melt-in-your-mouth sorbet, wafer-thin, crisp cookies, and soft and juicy berry compote. 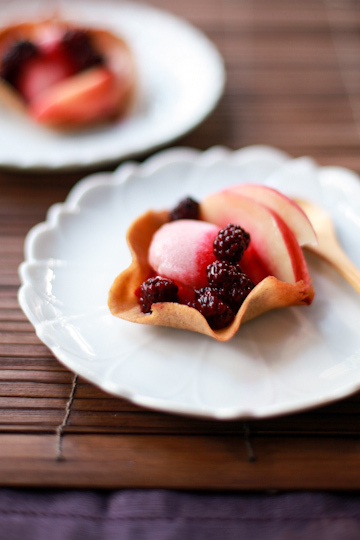 This is white nectarine sorbet with blackberries in five-spice cookie cups, also from David Lebovitz's Ready for Dessert. 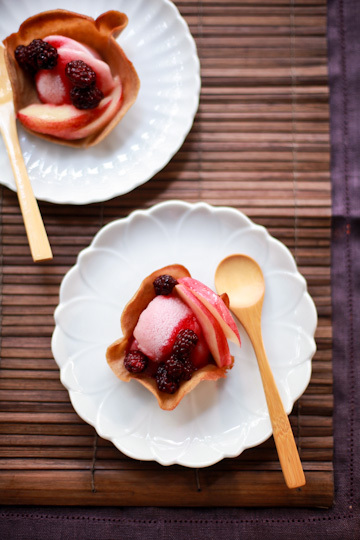 The sorbet was bursting with a delicate flavor of sweet white nectarine, the cookie had an Asian touch with a mixture of spices, and the blackberries were gently simmered in a syrupy-sweet reduced umeshu (Japanese plum wine - mine homemade, I might add). To tell the truth, I wasn't planning on making it all but the sorbet. But the umeshu blackberry compote sounded just so tempting I had to give it a try too. Then if I was to have the sorbet and compote, might as well I'd make the whole package, I figured. And I am glad I did, even if my batch of cookie cups left much to be desired (I made most of them a bit too thick and they wouldn't crisp up; the killer humidity of Japanese summer didn't help, either). 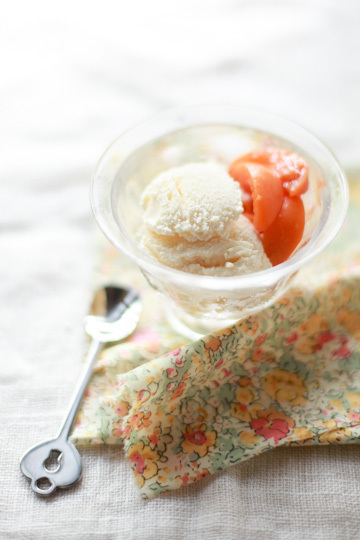 It was the cookie's spicy warmth that created a delicious contrast to the fresh peachy flavor of the cold sorbet. 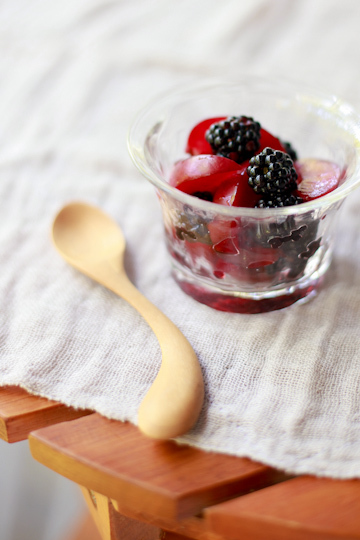 The concentrated sweetness of aroomatic umeshu blackberries added another flavor layer. And leftover white nectarine sorbet played a part in another treat. 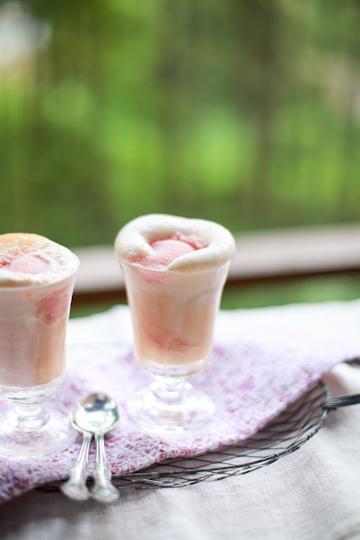 I had another batch of white peach-lavender soda that I mentioned before, and thought I'd make an ice cream float with it with the white nectarine sorbet. Throwing a scoop of good vanilla ice cream (Haagen-Dazs) and a few thin slices of white nectarine into the mix, I had white peach and nectarine ice cream float, which may look a bit of a mess here but tasted super good. Down in one! And oh, did I tell you I've had a lot of peaches, in addition to nectarines? 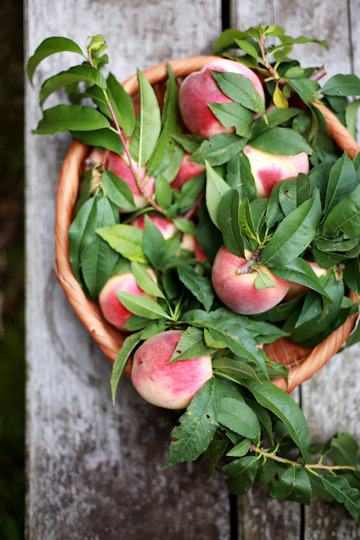 This gorgeous lot is from my folk's peach tree, but I bought a whole lot more at the green market. 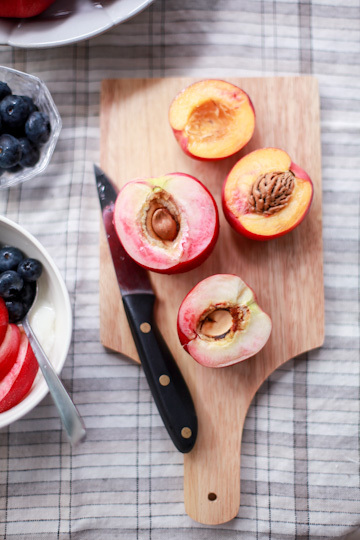 Like white nectarines, I like my white peaches best eaten fresh; on any given morning for the last few weeks, I'd be seen (or in fact, not seen) eating a dripping-ripe peach by the sink. I didn't do much else with white peaches, save for a couple of batches of the peach-lavender soda, and some compote. 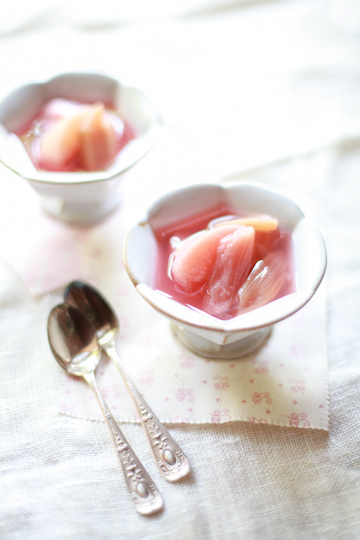 Pictured above is peach and rhubarb compote with rose petals, based loosely on a recipe found again in Nigel Slater's Tender II. A delicate scent of rose worked beautifully with the sweet peach. Nice served well chilled. 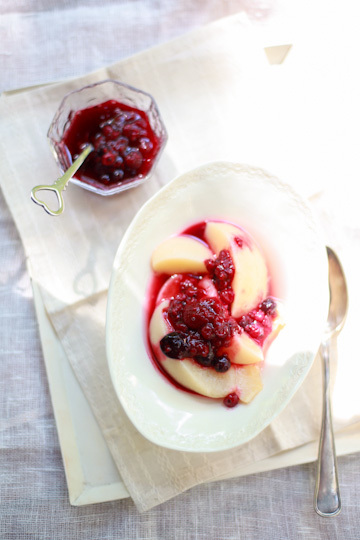 Lightly sweetened stewed white peach wedges were served with generous spoonfuls of red berry sauce - redcurrant, blackcurrant, and raspberries briefly cooked with a bit of sugar. Also from Tender II, this little treat called a dish of warm peaches with summer berries was meant to be served warm, and although it went against my instinct that questioned about eating white peach warm on a hot summer day (in Japan, not England), I did try it warm and was pleasantly surprised to find it really quite delightful. Out of curiosity I also tried it at room temperature, and chilled. While the chilled compote was nice, the flavor was a little dull compared to when it was warm - perhaps I would've needed a bit more sugar to have it chilled. So the conclusion was that this really was meant to be a "warm dish". What can I say, it's often worth following a piece of advice by an expert, especially if it's Nigel Slater! And well, about the berry sauce; I must confess I used frozen berries and currants here, because 1) I'd already run out of all of my fresh raspberries and currants, and 2) even if I had had any left, I wouldn't have dared to cook them into a sauce. Luckily, frozen berried worked fine here. 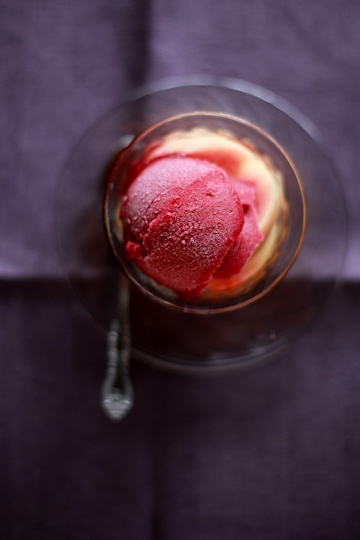 This was another thing I made with frozen berries, red wine raspberry sorbet, whose recipe I found in Ready for Dessert. 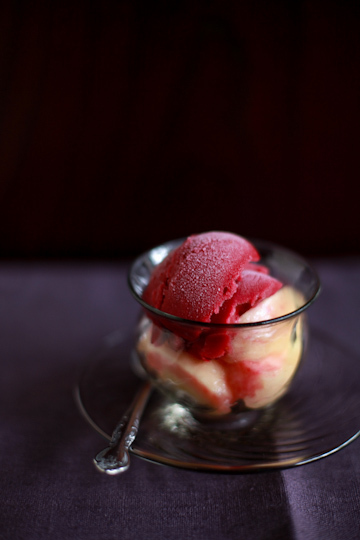 From this magnificent dessert book by David Lebovitz, the above-mentioned white nectarine sorbet was lovely, and the simple cherry sorbet has become our house favorite ever since I first made it a few years ago. 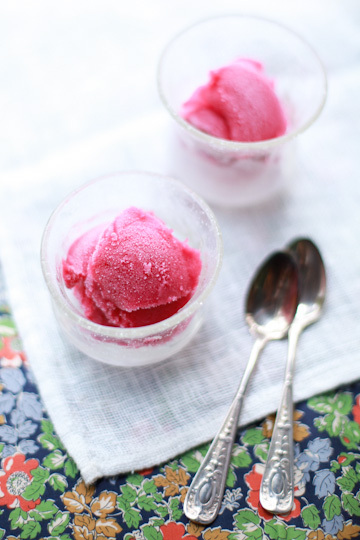 This raspberry sorbet was just as simply to make, perhaps even more so as you don't need to pit the berries like you do with cherries. Deeply flavorful with a touch of warmth thanks to the generous dose of red wine in it, this sorbet can be something you'd enjoy during the cold season, I imagine. 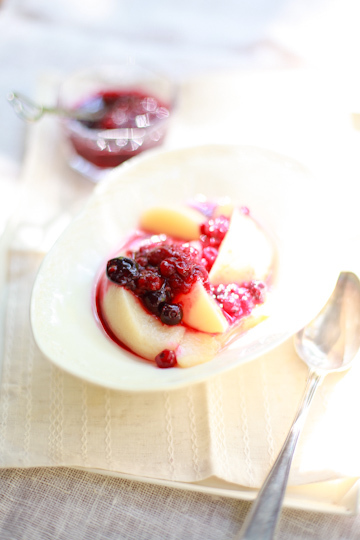 But here we had it with fat wedges of fresh white peach, so ripe it tasted almost like a compote. A link to the recipe for this sorbet can be found on the book's page on amazon.com. 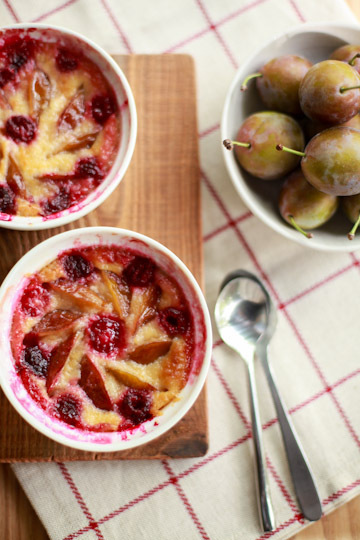 This is plum and raspberry clafoutis, making use of raspberries (frozen) and some early prune plums (fresh!). You probably think the plums, which we picked up at a green market, look too green for ripe prune plums, but they assured us that's just such a variety and they were perfectly ripe. And they were. Served warm, this had an unmissable taste of autumn for sure. The recipe is again by David Lebovitz, this time from his hilarious and delicious memoir/recipe collection, The Sweet Life in Paris: Delicious Adventures in the World's Most Glorious - and Perplexing - City (Broadway, 2009). Now how about some little cakes? 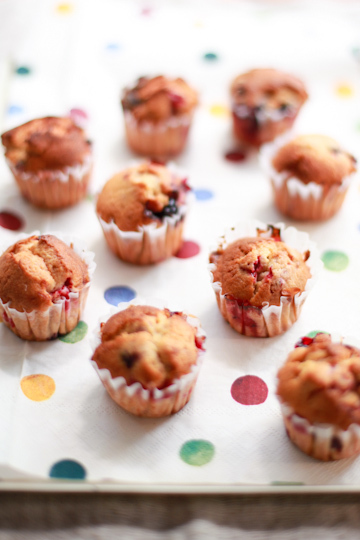 These little currant cakes fall in the category of cupcakes, but without frosting on - but instead are studded with small gemstones of redcurrants and blackcurrants, which make them look pretty enough. Another recipe from Tender II, the cake itself is really a simple, straightforward one - but the addition of bright little currants effectively perked things up. I'd never baked a cake with fresh currants (as in, non-dried; I used frozen currants here), and was excited to find that sharp, tart currants do a wonderful job in simple sweet cakes. 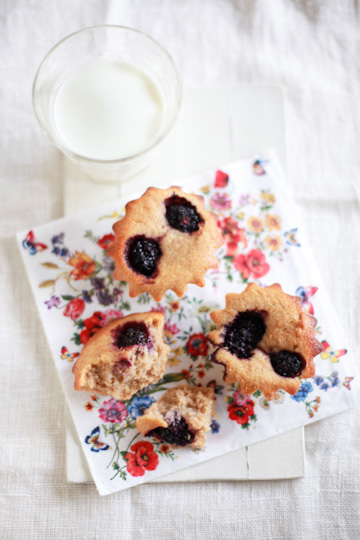 These are also little cakes, here dotted with blackberries with the batter making use of wholewheat and rye flours, as well as ground almonds. 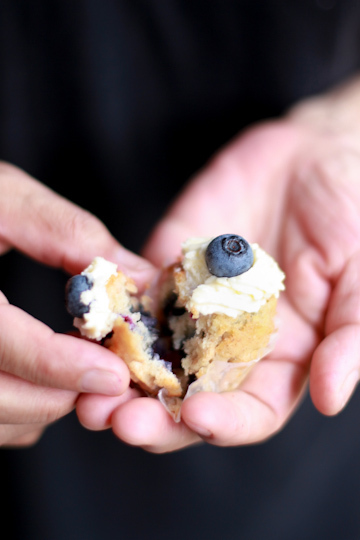 These blackberry almond tea cakes were a gift from Sigrid, a Rome, Italy-based blogger-photographer friend of mine. ...Well, these particular batch I made on my own, here in Nagano. But back in March when I met her (and her adorable one-year-old girl, Lena) in Rome while traveling in Italy, Sigrid handed me a bag of the tea cakes as a little welcome gift - in addition to keeping my company, cooking me lunch, and making sure I was well looked after while in Italy, which I was. So personally these little cakes remind me a lot of Rome and my time in Italy. Sigrid has her recipe on her blog, here (in Italian; should you google translate it to read the recipe, just note that the amount of the milk is "1.5 dl" which is 150 ml or scant 2/3 cups, NOT "1.5 cups" as the translation says. yikes!). 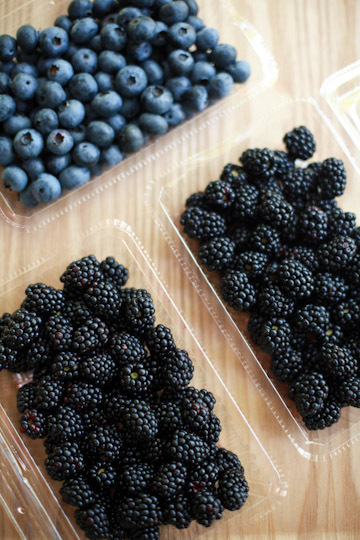 At any rate, I was glad I had blackberries (albeit frozen) so I could try and recreate them here. And then, there was something else I wanted to make with blackberries. 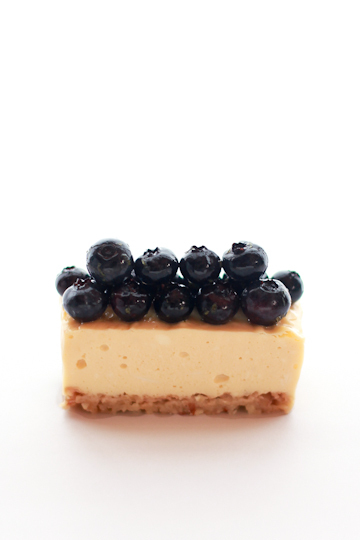 And this is... blueberry cheesecake. 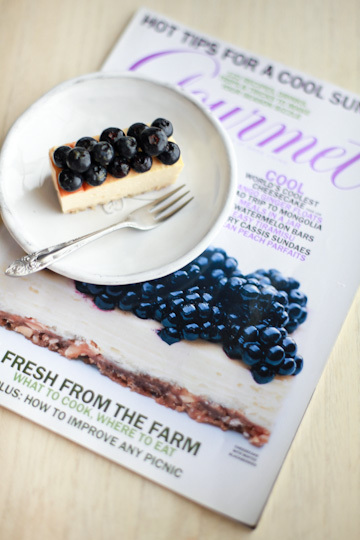 Cheesecake with minted blueberries, to be specific. 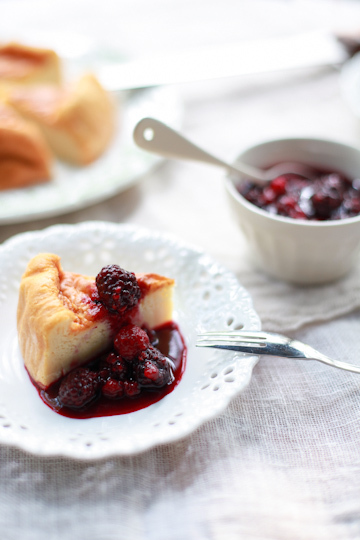 One day towards the end of August I was baking a cheesecake with a full intention of serving it with blackberries, as my family went out to the berry farm we'd bought fresh blackberries earlier in the month. Much to my disappointment, however, I was told that their blackberries were already finished for the season. The cake had already been baked, so what could I do? Well, make it with blueberries instead. So there you have it. Part of the reason I really wanted to make this cake was that I am digging its look ever since I saw it on the cover of an old issue of a once-discontinued, digitally-resurrected cooking magazine. That's August 2008 issue of Gourmet magazine, right here. I couldn't find the recipe in their vast recipe archive on gourmet.com, but it's a simple and rich New York-style cheesecake with a crust packed with chopped almonds, and served with fresh blackberries tossed in a bit of sugar and chopped fresh mint leaves. We enjoyed it, but... I just wished I'd had fresh blackberries. Hopefully next year. 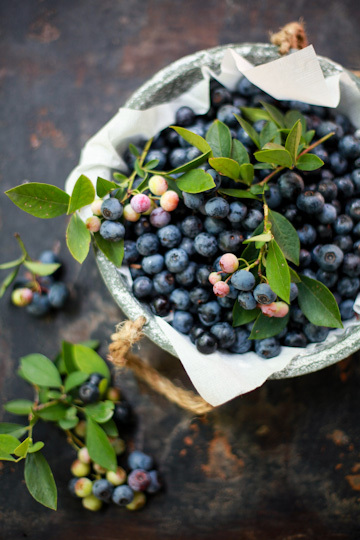 For now, we still have blueberries. 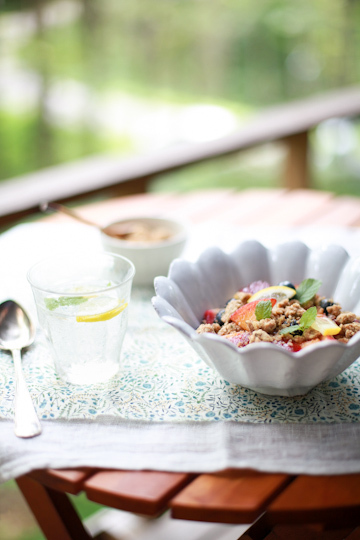 They have been the star of summer fruits for us here in Nagano, for the last couple of summers. At the end of July the green markets start to stock them up, and I was picking up a punnet or two every now and then. 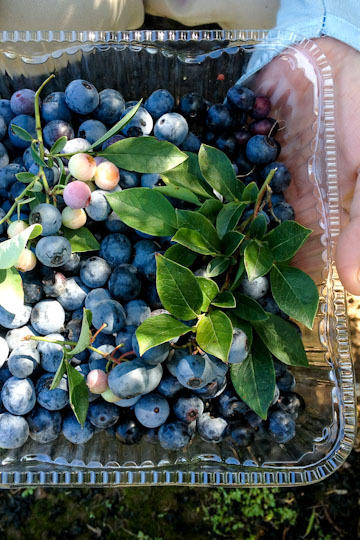 But the real show begins when we go to a blueberry patch at a corner of a family friend's huge vegetable fields. They are not a PYO farm and not open to the public, but have their friends and friends of their friends over to pick the berries for a really good price. So that's where I pick the little blue gems to my heart's content. We usually go there a few times over the summer, between the end of July and the end of August. This year we started a bit late and couldn't make it there until mid August. We ate them by the bowlful, cooked up a potful for a blueberry sauce, and froze bagfuls, and ate some more - in a few different ways. 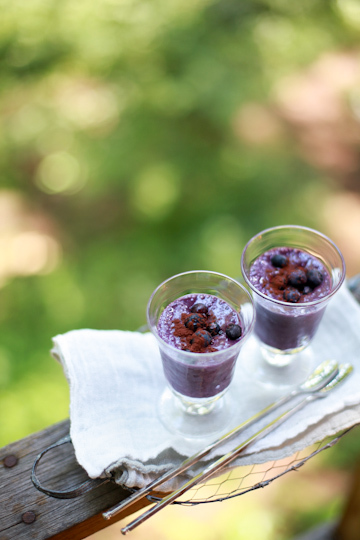 One of the things we've been having a lot in the summer over the past few years is this blueberry chocolate smoothie, a recipe from Lucid Food: Cooking for an Eco-Conscious Life by Louisa Shafia (Ten Speed Press, 2009). Packed full of blueberries with just the right amount of cocoa and a dash of maple syrup, this got us through many of those hot summer days. You can find the recipe in my last post. I made this little dessert just after I'd made the white peach-lavender soda I've mentioned earlier. 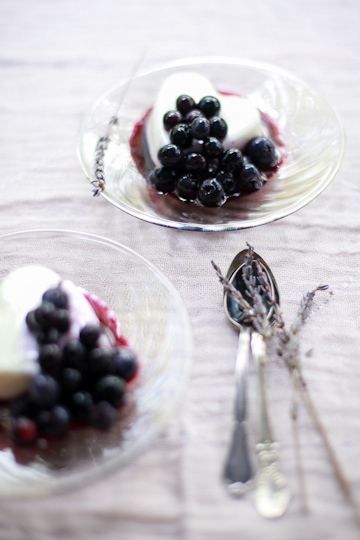 It's lavender yogurt panna cotta with blueberry compote - a cream-milk mixture infused with lavender and sweetened with a bit of honey, with some yogurt added to it before being set with gelatin. 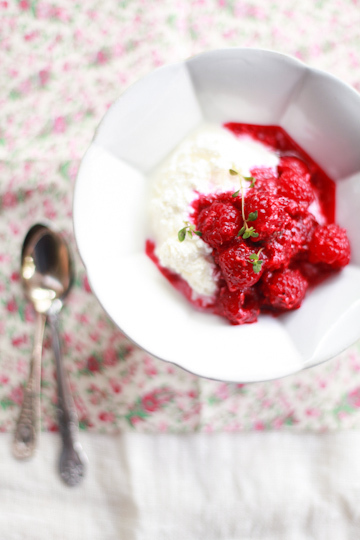 The compote was made in the same way as the raspberry lemon thyme compote I've written about about a decade ago (well, somewhere up in this post, which feels like a looooong time ago); whole fresh berries are tossed in a bit of cooked and pureed berries. 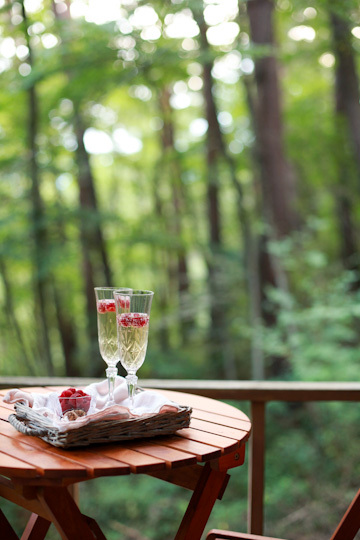 This really is a lovely way to enjoy fresh berries! 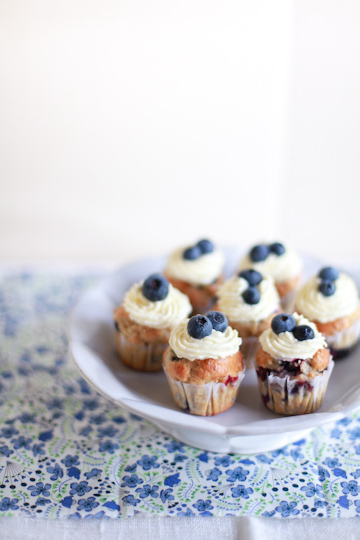 Mini blueberry cupcakes with cream cheese frosting. Now if you know me, I'm not really a cupcake kinda girl, and definitely not a frosting person. But I wanted to make these, and here they are. If you can go easy on details, I think they are pretty enough. Just about. 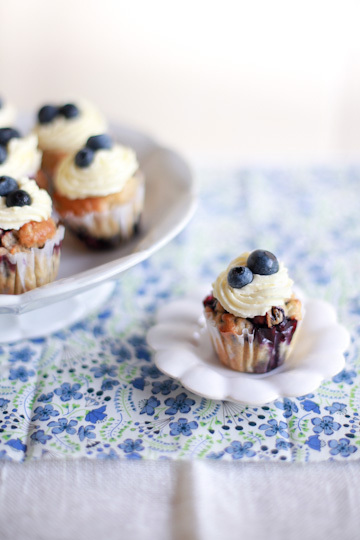 The blueberry cupcake recipe is from here, which has one interesting ingredient: potato. Yes, it's got mashed potato in the batter, which may sound odd but trust me, you don't taste potato in the cake; it just gives some moist texture and body to the cake, I suppose. The batter was easy to whip up, and the cake baked up fine. As for the cream cheese frosting - well, it wasn't so easy. I used this recipe, which uses whipped cream, because I wanted something that's not a butter cream. Basically, you just whip the cream, cream the cream cheese with sugar, and mix them together. Sounds simple, right? Except it didn't turn out right for me, at all - it was WAY too runny to pipe, even after I, now little panicking, put it in the fridge AND freezer. I then read the reviews and it became clear that I wasn't the only one having this problem; the key, apparently, was to whip your cream really stiff and keep it really cold. So I ended up asking my folks to go pick up more cream and cheese, and making another batch all over again, this time whipping the cream in an ice-water bath. I also used confectioner's sugar. And this time, it worked! Phew. I was feeling a bit dreadful, wondering if the cakes would be worth all this effort. Thankfully, they were - they tasted pretty good, especially the frosting which we all loved. Heck, I might even make it again. The cupcakes tasted lovely when thoroughly chilled. Meanwhile, the first, failed batch of frosting tasted still good, and I couldn't bring myself to just toss it. But there was too much for me to lick clean, so I decided to 'recycle' it. Throwing some flour, corn starch, and eggs (the whites were whipped to stiff peaks) into the frosting, and in it goes to the oven - and voila! You have a cheesecake. Turning a leftover/failed frosting into a cake is a trick I've used before, as I I did with peanut butter frosting last year. I don't measure ingredients but just adding a tablespoon of this and a handful of that, so the results are not guaranteed. But so far, it has proven to be a pretty good way, and definitely better than throwing the whole thing away. Served with some stewed berries - raspberry, blackberry, and redcurrant -, the cake was totally fine. Perhaps not the best cheesecake I've ever had, mind you, but good enough to make a little afternoon treat. And this, my friends, is much of what I've made with glorious summer fruits these past couple of months. ...in addition to some light flavored waters and more fruity drinks. Quite a lot of stuff, right? A bit overwhelming, even to me. 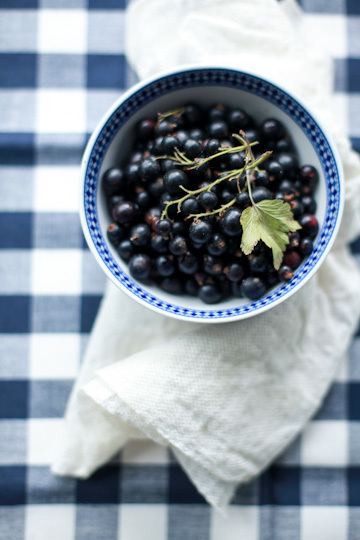 But we were really lucky to have been able to enjoy so much of beautiful summer fruits. We've preserved some of them, by freezing them, making jam/sauce/compote, or putting some in booze. 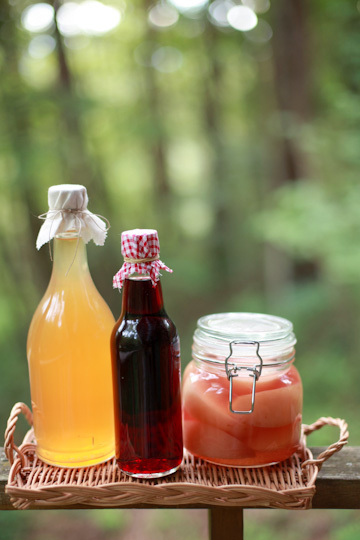 Here is my bottle of apricot cordial that I made in July, together with cherry cordial that I made in the same manner. I've also canned a jar of peach compote for later in the year. 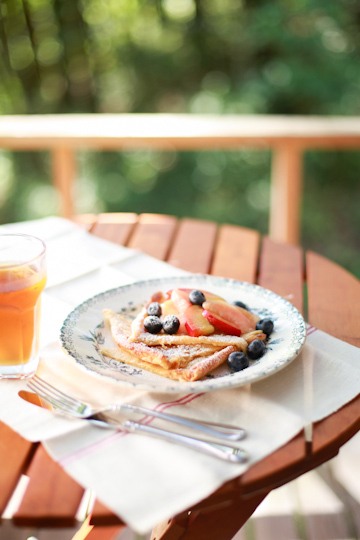 I think I'm now almost ready to move on to autumn - after savoring the last of the blueberries and peaches, that is. And oh, writing a fruit tart post, as well. hi chika, I'm really starving looking at all the beauties you make! fabulous and yummy yummy! Thank you again for all those magnificients recipes, I always enjoy so much (taking the time;) to read you ! 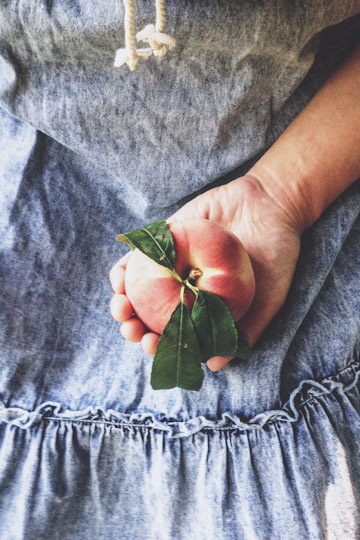 I am completely in awe of your art - the food, the photography, the story...what a lovely post. I will return to it again and again for inspiration, I am sure. wow, stunning! 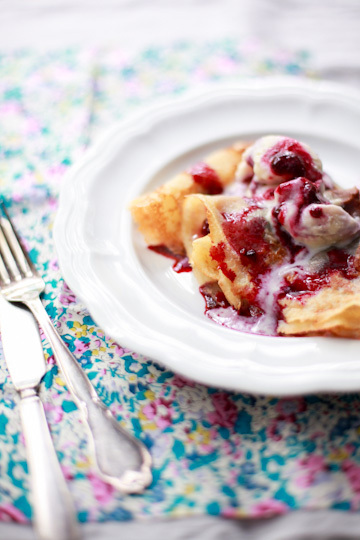 Can I just ask you to post also the gooseberry fool recipe? I would like to try it, maybe in the next summer... thanks! I so look forward to your posts - they're so thoughtfully composed. This one is a beautiful retrospective of summer. I've been cooking from Ripe all summer as well, and am excited to try some of the fall fruits - figs, and plums, and chestnuts - as we move into that season. Beautiful post as always with lots of detailed information and fabulous photos. I have been always amazed how you enjoy baking and cooking in season. And every recipe you have introduced is a fantastic finding. 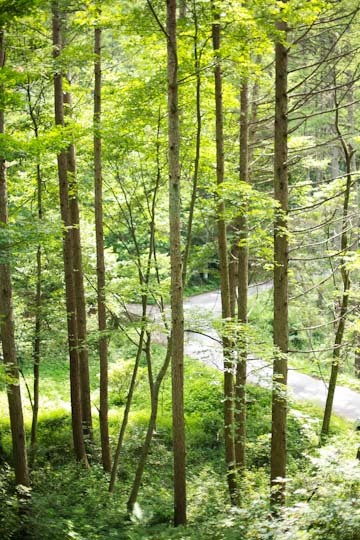 1st photo with trees reminds me Poland..
Superbe blog, bravo et merci ! Wow. You make me feel like I'm in a fairy tale. I'm going to visit again. Wow how beautiful are all the things you made. What a great blog. Hi Chika, i follow your blog from Spain. Thank you for sharing so much delight and beauty. I love your photos and food style much more than recipes . They are incredibly inspiring to me. Thank you so much for take the time; you "catched" the summer spirit, and ...yes, now we are ready for fall! I think I lost counting your beautiful deserts, berries, peaches and all! Too bad winter has already come and cant find any of them any more!!! Your blog is so inspiring and filled with beautiful pictures! 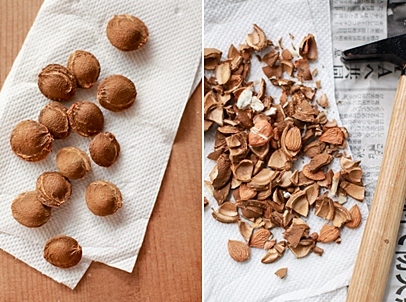 I love your food styling and every photos in this post! you are so good on taking pictures. they are look so cute and nyummy!